On the 23rd May Tower Hamlets celebrated this years GLL Sport Foundation (GSF) athletes at the newly reopened iconic Poplar Baths. This year 73 athletes in the borough received an award compared to 63 athletes last year. 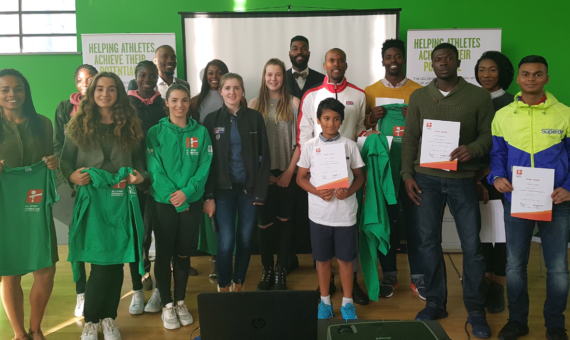 Athletes who were awarded Achievement, Top Up, Ambassador or SportsAid awards were invited to Poplar Baths to collect their cheques, certificates and t-shirts on the night. We look forward to following their progress throughout the year. Presentations were completed by GLL’s Head of Sport and Communities Phil Lane, GSF Manager Mark Gliddon and Tower Hamlets Council’s Partnership and Participation Manager Tim Clee. We were also lucky enough to hear motivational words from Olympic athletes Perri Shakes-Drayton and Conrad Williams who inspired the other athletes with stories of their sporting journeys and who gave advice on how to compete at the highest level. After presentations everyone was left to network and mingle – we saw our biggest social media traction for a while from the athletes who showed their appreciation for the GLL Sport Foundation. The Olympians were very engaging and had obviously inspired the younger athletes who had photos taken with them and stuck around to hear their stories. The event was a great success and we look forward to next year where we hope to increase the amount of athletes we support from the borough yet again!